Ashley Koff Approved at the Buzz Girls 2 year Anniversary Party – see some of the brands AKA recommends! Align Digestive Care – probiotic supplement – Not all probiotics are created equal – for optimal results, strain specificity and quantity are critical as well as viability at the time of consumption (bacteria must be alive to be effective). Ascenta NutraSea fish oils – Not all fish oils are created equal – what matters is purity (look for “pure √” symbol), concentration, and how it is processed to prevent oxidation. Ayala’s Herbal Water – Many are bored with plain water, this provides flavor with health benefits (i.e. digestion, stress reduction) without adding sugar, calories or artificial ingredients. Coconut Bliss soy, dairy & gluten free ice cream – A true treat is one that is indulgent, tastes great and contains ingredients about which you can feel good. Crofter’s Superfruit Spread – Unlike competitors’ products, this sweet taste comes from mostly organic berries and a little organic sugar. Dr. Khalsa’s Vitamin D3 – Low Vitamin D is implicated in everything from ADD/ADHD, cancer risk and survival, and hormonal health. This site offers a test kit to test your levels, a book and supplements for further information and treatment. Healing Movement – Raw Cultured Vegetables and Young Coconut Kefir – Optimal health begins with a healthy digestive system. 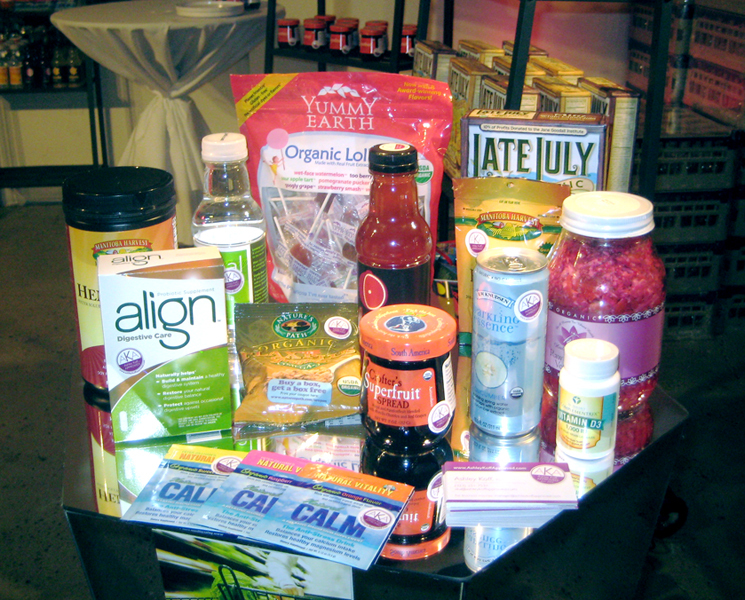 These organic products help reduce bloating, alleviate sugar cravings and assist transition to a healthy digestive tract. Late July Organic Snacks – mini sandwich cookies – Mom knows best (in this case, Grandma, Dad and Mom)! Providing all of our favorite snack treats made healthy without sacrificing taste. Manitoba Harvest Hemp Foods & Oils – hemp protein and hemp seeds – In hemp, nature provides us the only food source of certain fatty acids as well as a complete protein. Natural Calm – The Anti-Stress Drink – nutritional magnesium powder – When it comes to magnesium, whose benefits include – aiding digestion, reducing the effects of stress, and heart and bone health, this product stands out as organic and highly absorbable. Nature’s Path Pumpkin Flax Plus Granola – because organic can and does taste great, these products make any meal satisfying and healthier. Nuttzo – organic, omega 3 multi-nut butter – this crazy combo of nuts and seeds provide fiber, omega 3’s, complete protein and minerals with a delicious crunch. Olade organic, electrolytes, zero sugar added beverages – diabetics and non-diabetics alike should choose organic beverages that are naturally very low in sugar (sweetened with stevia)…and taste great! R.W. Knudsen Sparkling Essence – light and refreshing beverages for anytime of the day. Yummy Earth Organic Candy – lollipops, gummy bears and gummy worms – a candy you can feel better about because they are organic with no artificial coloring and per portion are lower in sugar than other candy – a treat for kids and adults alike! This week the Center for Science in the Public Interest updated the findings of its’ historic study about the caloric and fat overload found in many a movie-goer’s favorite treat – popcorn. The advertised nutrition information is incorrect “Regal says that its medium popcorn has 720 calories and that its large has 960. But CSPI’s lab tests found that those numbers were understated. Regal’s medium and large sizes each had 1,200 calories and, thanks to being popped in coconut oil, 60 grams of saturated fat. (The large size looks bigger, thanks to its titanic tub, but it costs a dollar more and comes with a free refill.) A “small” at Regal has 670 calories and 34 grams of saturated fat. That’s about as many calories as a Pizza Hut Personal Pan Pepperoni Pizza—except the popcorn has three times the saturated fat. Talking while you’re eating, chewing gum, smoking and drinking through a straw can all cause you to swallow excess air, leaving you bloated and uncomfortable. Allow yourself to enjoy occasional treats, but limit yourself to just a taste or bite. The smaller portion will be better for your digestive system and prevent excess bloating. Of bacteria, that is. It’s important to have a good balance of beneficial bacteria (“probiotics”) in our digestive systems. When used daily as directed, a daily probiotic supplement like Align with Bifantis, can help restore a natural balance with ongoing probiotic protection. Keep this in mind the next time you go for a treat. Sugars, dried fruit, sweeteners, and juice are treats that may not be friendly to all digestive systems. Carbonated drinks like sugary sodas will make your stomach puffy and distended. Keep it simple – stick to water with lemon or herbal tea. Spices don’t just make your food taste good, they’re important for your overall health too. Ginger and tumeric have anti-inflammatory properties, while caraway, cumin and cinnamon play a role in digestion and can help with weight management. Adding different spices to your meals and snacks can help spice things up … the right way. Hop on the treadmill, hit the dance floor or just run around with your nieces and nephews – anything. Working up a sweat releases fluids your body might be holding, and just 20 to 30 minutes of exercise each day can help to move food along your digestive tract so bloating won’t weigh you down. Download a fun tip card for yourself. Here’s what AKA had to say about the topic on Good Morning America Health earlier this week. How Sweet, Cereals to Support Immunity? According to Kellogg’s, their kid’s cereals contain vitamins that “help support immunity” …AKA says NO WAY! Whether it’s gummy candies fortified with vitamins or cereals done the same way – the KEY ISSUE is the SUGAR. We know that while vitamins MAY help – and this depends on quality and dosage – support the immune system, we know for CERTAIN that SUGAR suppresses the immune system and feeds the bad bacteria often responsible for colds (not a virus). Parents who want sure fire immune supportive solutions should look to Nature’s Candy bowl – fruits in a variety of colors, nuts and seeds – as well as limiting the amount of sugar their child consumes…think Apples vs Apple Jacks! know where your ingredient comes from – Organic (USDA logo)…with AKA I investigate not just “what” the ingredients are but where’s their source so my list should be a useful tool when choosing agave containing products. quantity is still the key concept. If we over consume agave at an eating occasion or during the week, we have over consumed bringing up issues such as imbalanced blood sugar, extra weight, higher fat mass, insulin resistance.